In celebration of the upcoming Academy Awards on February 28, we are dedicating every Thursday night this month to Oscar winners! We start with the man who was responsible for bringing many Oscars to Columbia Pictures - Frank Capra. Columbia's President Harry Cohn hired Capra when the studio was still struggling for respectability and known as "Poverty Row." This was in stark contrast to the polish of Paramount and stature of MGM. Though Cohn and Capra frequently clashed, the studio head still recognized the vast talent of the writer-director-producer. Capra would, in fact, be responsible for the big breakthrough for Columbia with 1934's It Happened One Night. It was a movie that started small, gained momentum through word-of-mouth, and then shocked everyone when it swept every major award at that year's Oscars - Best Picture, Director, Actor, Actress, and Screenplay. It was a seismic shift in the industry and an achievement that would not be matched again until 1975. Capra continued to deliver great films for Columbia and our first film of the month would premiere only two years later. Capra is known for pictures that center around the "Everyman," and that was particularly powerful with Depression-era audiences. In 1936's Mr. Deeds Goes To Town, Gary Cooper plays Longfellow Deeds, a resident of a small town in Vermont who leads a simple life until he inherits a vast fortune. Soon an unscrupulous lawyer brings Deeds to New York City and the unassuming heir becomes the object of much media attention. 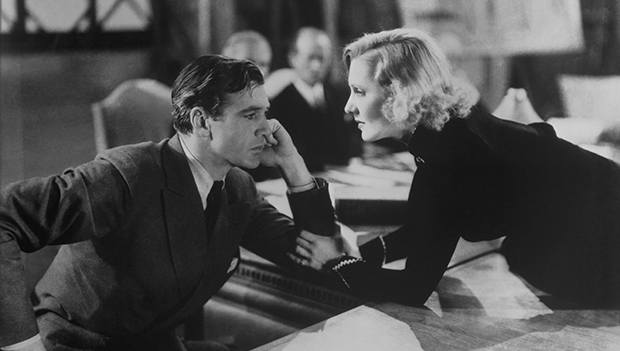 Jean Arthur, in her first featured role, plays a clever reporter who tricks Deeds in order to gain his trust. However, she is soon torn between her big city cynicism and a desire to believe in love. Capra would win his second Oscar for Best Director for Mr. Deeds, and the film would receive four other nominations including for Best Picture. Jean Arthur plays a similar role in our next film - 1939's Mr. Smith Goes To Washington. It was originally meant to be a sequel of sorts to Mr. Deeds, but then took a slightly different turn with leading man Jimmy Stewart. Everyone now knows the movie - the story of idealistic Jefferson Smith (Stewart) who is appointed to serve his state upon the death of its junior senator. He then heads to Washington D.C. where he suddenly finds himself battling ruthless politicians out to destroy him and the ideals for which he stands. Mr. Smith won an Oscar for Best Original Story, and was nominated for another ten including Best Picture.